Vacation rental cabin / bungalow. Sleeps 12, 3 bedrooms, 2.5 bathrooms. Dogs allowed. Climbing the beautiful wood stairway leads you to two bedrooms, a loft and full bath. A queen bed sits in each bedroom while the loft has 2 queen beds and 2 futons for additional sleeping. The loft has a small living area. There is a stacker washer and dryer in one of the bedrooms. 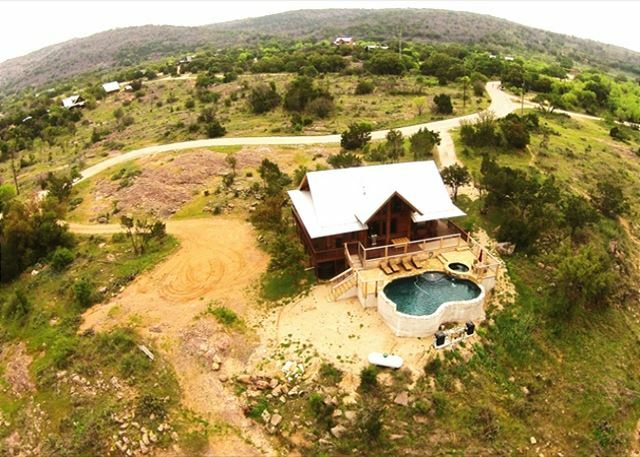 Outdoors is furnished with a charcoal barbecue pit, picnic table, wrap around porch with vast hill country views. 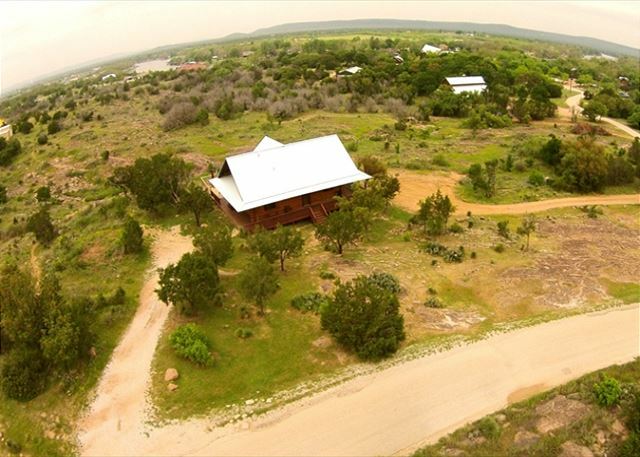 Although this cabin is not on the water it is only a short walk (about 400 yards) to the common area located between the office and Lake LBJ. Your group is welcome to enjoy the patio, picnic tables and chairs for picnics and family fun. You are welcome to bring your personal watercraft, but the Boat Room offers watercraft rentals (motorized and non motorized) for your pleasure as well. Complimentary putt-putt golf is a great way to have a little competitive fun. The roped off swimming area and rope swing will be a favorite during the hot summer days. Sand volleyball is always a popular place for guests. If you prefer being a fan instead of a player, there are plenty of places to sit in the shade and enjoy the games. The start of the Sarayu Trail is just below Cloud 10 and is a fun way to explore nature throughout the 170 acres of Log Country Cove. Whether young or young at heart, you will find Cloud 10 and Log Country Cove to be one of your favorite vacation spots. Our entire family had a blast at Log Country Cove and we will definitely be back! The folks there are extremely nice and very available to help. The house and entire property was outstanding. Our family stayed at the Cloud 10 at Log Country Cove for an extended weekend and had a great time! The cabin was comfortable and clean and the pool and hot tub were awesome! Recently stayed 3 nights at Cloud 10. The outdoor space is absolutely incredible. The pool is fantastic though the surface is fairly rough; my toddler daughter ended up with scraped knees from playing on the pool landing. Before I continue let me state we had high expectations for the property since we had previously stayed at a home in Log Country Cove which was incredibly spotless. Walking into Cloud 10 everything looked nice but on closer inspection it needs a few things looked at. There was dust everywhere, especially dust bunnies on the floor. Many blinds are not functional. And more than anything the bathrooms need updating or an extreme deep clean. Really nice jacuzzi tub in the downstairs bathroom but hot water ran out within a minute or 2. The shower’s water pressure was really low. (We did inform the ladies in the office about the hot water.) I could continue with a few more grievances but overall I would still recommend the property for the outdoor space since that’s where we spent most of our time (as long as the hot water issue is corrected). My wife and I, along with our three boys (13,11,8) stayed here the week before thanksgiving. Log Country Cove and Cloud 10 far exceeded any expectations we had prior to arriving. We were sad to leave. Whether you want to sit inside and admire the log cabin construction, sit outside and admire the view, sit in the hot tub, or hike a trail, this place is the place for you. 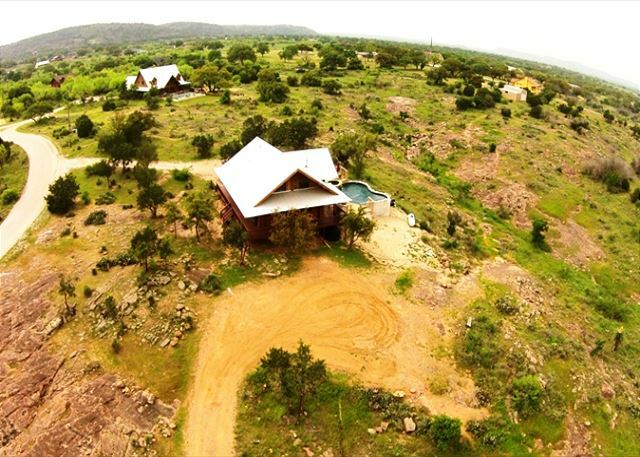 We chose Cloud 10 because of privacy and seclusion, yet liked how it was still close to trails, and only a 5-6 minute walk to main activity area. Our boys loved putt-putt, and we fished all the little boat channels that were accessible around LCC. We caught about 12 large mouth bass fishing with spinner baits and finess worms (pumpkin seed and red bug). The largest fish we caught was about 2 pounds. The boys loved it. The cabin had everything we needed (except a lighter for the bbq pit and fire pit), and all we needed was food, drinks, and charcoal. All appliances were great, everything functioned great, and beds were even comfortable. Main bedroom had a king size, loft had 2 fulls plus futon, and there were two other bedrooms upstairs with a full/queen in each. Plenty space for everyone, and downstairs furniture was perfect for a spot to curl up with your wife and watch Romantic Christmas Comedies on Hallmark channel (hahaha). We plan to return here every year, and maybe go at different times so we can actually use the pool, too. Thank you Log Country Cove for a wonderful getaway that was way better than we hoped for and worth every penny! Perfect place for our vacation! We thoroughly enjoyed our visit to Cloud 10 at Log Country Cove! We've been to LCC many times, but had never stayed in this home before, and it suited our needs perfectly with two adult couples and two teenagers. The pool and hot tub were AMAZING -- we heated them (an extra charge) to our liking, and it was the highlight of the trip to enjoy those since the lake was closed (due to recent flooding). Our only wish was that there were clearer instructions in a central location for things like how to use/adjust the heat/AC, heat and jets for the pool/hot tub, and the Direct TV (very complicated for those who've never used it, and the front desk couldn't help us at all). Also, it's good to be aware that due to the log cabin construction, it's very noisy in the downstairs bedroom if the people upstairs are getting up in the night (or morning!) and you're trying to sleep -- can't be helped, it's just part of the construction style -- but people pretty much need to go to sleep and wake up at the same basic time. Beds were all especially comfortable! We'll definitely be back, and will stay in Cloud 10 again!